KINSMAN – With the busyness of Christmas time already in full gear Pastor Jordan Biel and other staff members of Rock of Grace Church are doing their best to remind people of the real meaning for season through several community-wide events/services being held throughout the month of December. (From Nov. 30 edition). As far as ways people can reflect on this particular scripture this year Biel said will include their Christmas eve service at 3:30 p.m. and 5 p.m. on Monday, Dec. 24, along with a few events beforehand such as their kids’ Christmas music program at 8:30 a.m. and 10:30 a.m. on Sunday, Dec. 16, as well as through a low-key Christmas party and potluck at 6:30 p.m. on Wednesday, Dec. 19. In regards to the children’s Christmas program as organized by Christine Berry, Biel said will consist of about five or six songs that will include solos from Kyleigh Hall, Oliva Berry and Elli Biel in Ends of the Earth, Ruby Smegal in What a Beautiful Name, as well as Brynlley, Cambrya and Gracyn Kitzmiller in Glory to God in the Highest. Additionally Biel said that attendees and members will also have the opportunity of being part of a special collection this year in which they are trying to raise money for a family who were involved in a car accident and are in need of a handicap accessible bathroom and wheelchair ramp through the help of Biviano Carpet One Floor and Home who is also offering donations towards the task. For further information about Rock of Grace’s Christmas happenings or to donate towards the family in need they are collecting for please call (330) 924-4431, stop in at their location of 6745 State Route 5 or visit their website: https://www.rockofgrace.org/. 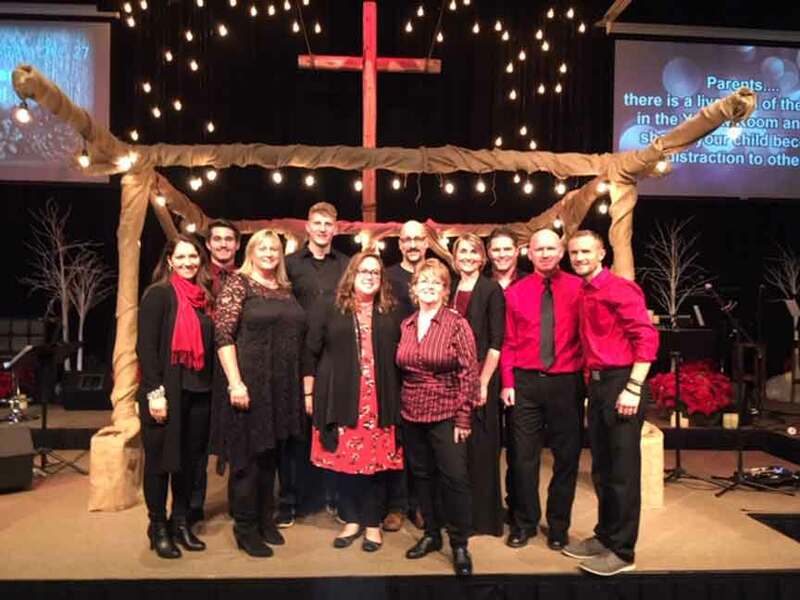 Pictured: Rock of Grace’s Adult Choir performing a holiday program in 2017 within their location of 6745 State Route 5 in Kinsman. According to Pastor Jordan Biel this year their staff plans to hold a children’s Christmas program, a low-key holiday party/potluck, as well as two Christmas Eve services throughout the month of December.